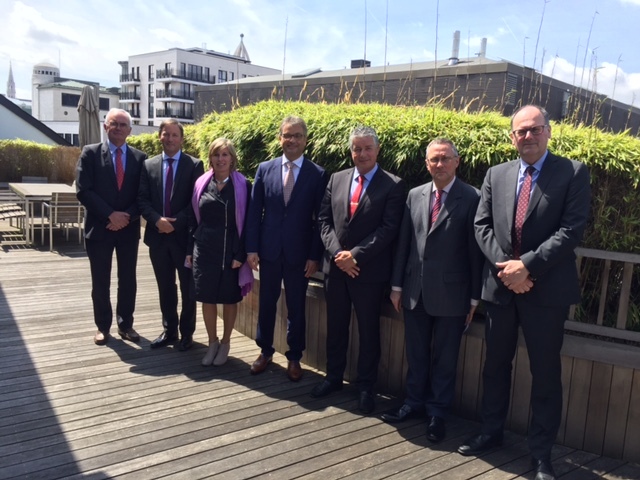 From left to right: Mr Philippe Van Der Donckt, Business Development Director, Umicore and Vice-Chairman FCCC; Mr Philip Eyskens, Senior Vice President Legal, IT and M&A, Bekaert and Board Member FCCC; Ms Gwenn Sonck, Executive Director FCCC; Mr Stefaan Vanhooren, President Agfa Graphics, Member of the Executive Committee of the Agfa Gevaert Group and Chairman FCCC; Mr Marc Vinck, future Ambassador of Belgium in China; Mr Peter Lescouhier, Director Belgian Ministry of Foreign Affairs; Mr Bart De Smet, Chief Executive Officer, AGEAS and Vice-Chairman FCCC. On May 22, 2017, the Board of Directors of the Flanders-China Chamber of Commerce (FCCC) had a meeting with the future Ambassador from Belgium to China Mr Marc Vinck at Umicore in Brussels. The Flanders-China Chamber of Commerce (FCCC) is organizing a meeting with the future Ambassador of Belgium in China. This event will take place on Monday 19 June 2017 at 18h00 in Brussels. This event is an excellent opportunity to introduce your companies’ activities in China with the future Ambassador of Belgium in China, Mr Marc Vinck. LEAD-IN and the Flanders-China Chamber of Commerce organized their joint conference which explored Western and Chinese models of business leadership with an expert panel of business leaders and academics: “SHARING CHINESE & WESTERN LEADERSHIP INSIGHTS”. Different cultures can have radically different leadership styles and it is important for international organisations to understand them. As European business continues to expand into China, and Chinese companies establish operations around Europe, employers need to integrate both Chinese and European perspectives into their leadership models. Understanding the inherent differences between Chinese and European leadership styles is essential for successful talent management programs. Our conference gave participants a clear understanding of the similarities and differences between Chinese and European leadership styles and how to apply them to their company. A Q&A session, closing remarks by Mr Bart De Smet, Chairman Lead-In, Vice Chairman, Flanders-China Chamber of Commerce, and a cocktail reception concluded the event. The Flanders-China Chamber of Commerce, the Cheung Kong Graduate School of Business and the Province of East Flanders organized the One Day China Immersion Programme: “Understanding China’s Next Move”. This programme took place on May 22, 2017 at the Provincial House in Ghent. Gwenn Sonck, Executive Director, Flanders-China Chamber of Commerce, introduced the programme to the participants. Mr. Bo Ji, Chief Representative of Europe & Assistant Dean of Global Executive Education at Cheung Kong Graduate School of Business (CKGSB) presented the different modules. To conclude the event, award certificate from CKGSB, the Flanders-China Chamber of Commerce and the Province of East Flanders were presented to the participants. Geely, the Chinese owner of Volvo Car, has agreed to acquire a 49.9% stake in struggling Malaysian car manufacturer Proton, and control of British sports car brand Lotus. The Hangzhou-based carmaker agreed to “support the transformation of Proton and Lotus” to make Proton “the most competitive brand in Malaysia”, according to a press statement. The deal, which came as a dramatic about face after senior executives of Geely had previously said they dropped their bid, is expected to help Geely grow in the Southeast Asian car market and to claim ownership of Lotus – an iconic global sports car brand – owned by Proton. Proton was put up for sale earlier this year, drawing interest from Renault and Peugeot’s parent PSA. “With Proton and Lotus joining the Geely Group portfolio of brands we strengthen our global footprint and develop a beachhead in Southeast Asia,”said Daniel Li, Chief Financial Officer of Geely Holding Group. Proton has been bleeding red ink with its market share declining year after year after failed attempts by its conglomerate owner DRB-Hicom to rehabilitate the company.